Bill Kaihe'ekai Mai'oho doesn't remember the first time he heard the family story of how his ancestors secretly buried the bones of Kamehameha the Great. "It is so much a part of me, my family, I can't remember when I didn't know the story," said Mai'oho, the sixth generation of his family to care for Mauna Ala, the Royal Mausoleum built on 3.5 acres of land in the heart of Nuuanu, where six of the last eight kings who ruled Hawaii are buried along with other alii. According to the Mai'oho family's version of the story, King Kamehameha I was fond of a young high chief whom the king renamed Hoapili ("attached to the bosom" or closest to the heart). The warrior king who united the Hawaiian islands chose Hoapili and his brother, Ho'olulu, also a high chief, to take his iwi (bones) to a secret burial site, away from enemies who would want to desecrate the bones or steal their mana (spiritual energy). "Kamehameha was a planner, so he talked to Hoapili and Ho'olulu about where his iwi should be hidden," said Mai'oho, noting Kamehameha wanted his bones protected from desecration not only from rival chiefs, but from westerners who were sailing into the islands and sacking sacred sites. In May 1819, when King Kamehameha died in Kailua-Kona on the Big Island, his bones, in accordance with traditions afforded high kings, were separated from his flesh and placed in a kaai, a basket woven of sennet cordage. Mother of pearl was inlaid for the eyes and the king's own teeth formed the mouth, said Mai'oho. His flesh was thrown far out to sea. On a moonless night, Ho'olulu took the casket from where it was placed in Ahu'ena Heiau and met Hoapili in a canoe accompanied by Keopuolani, the king's favorite wife. They paddled to an undersea cave that could only be accessed at low tide and buried the iwi. To this day, the location has been rumored but never found. Two months later, Ho'olulu had his first child, a son. To commemorate the event of secreting the king's bones, Ho'olulu named his son Kaihe'ekai. Mai'oho, who is the fourth generation of his family to bear that name, said that while its literal meaning "is ocean-squid-ocean, its hidden meaning is about receding waters and how Kamehameha's iwi are buried in an underwater cave where no man's eyes can look." He added proudly, "I am named William Kaihe'ekai after my grandpa, who was William Kaihe'ekai Taylor and my mother's father." The single-story green house on the grounds of Mauna Ala where the caretaker lives is called Hale Ho'olulu or House of Ho'olulu. Mai'oho's family came to Mauna Ala in 1893, when High Chiefess Maria Beckley Kahea, a descendent of the Ho'olulu line, was appointed kahu (caretaker) by Queen Liliuokalani. Kahea was succeeded by her son Fred Beckley Kahea, who served until 1946. In 1947, Mai'oho's grandfather William Kaihe'ekai Taylor succeeded his cousin Kahea as kahu. 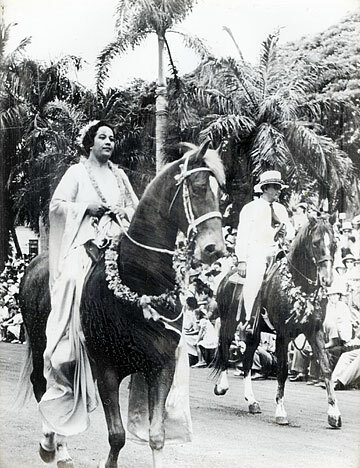 When Mai'oho, the first-born male grandchild was 2 or 3, his mother sent him to live with his grandparents for a few years at Mauna Ala.
William Kaihe'ekai Taylor, shown here on horseback with his wife, Emily Kekahaloa Namauu Taylor, served as caretaker of Mauna Ala from 1947 until 1956. His wife was appointed and served until 1961. Each morning, Mai'oho's grandfather would go outside to tell the stories of Mauna Ala to visitors. Mai'oho, wanting to hear those stories, would rush to the door only to be stopped by his grandmother reminding him of chores. She would also tell him that his grandfather met with many visitors and that if he wanted to listen to the stories, he must be quiet. "She told me that I had two ears and one mouth and that I was to work doubly hard with my two ears and not to use this (his mouth)," laughed Mai'oho, gently recalling his well-loved grandmother Emily Kekahaloa Namauu Taylor. And if he were quiet, he would be allowed to sit in the family circle to hear the stories of his kupuna. "I became a very good listener and in that listening process of learning, learned a lot about culture, history, genealogy and gossip about people who were alive then and the ancestors," said Mai'oho, adding, "My grandmother would always say no go brag outside of the family." Mai'oho's grandfather oversaw Mauna Ala from 1947 until his death in 1956, when Mai'oho was about 10. By then, the job was under the jurisdiction of the Territory of Hawaii, which appointed Mai'oho's grandmother Emily Kekahaloa Taylor, a renowned genealogist and songwriter, to take over for her husband. For a while, Mai'oho lived again at Mauna Ala to help his grandmother. But an illness rendered him bedridden for seven years during his teens and time was mostly spent in hospital isolation units. 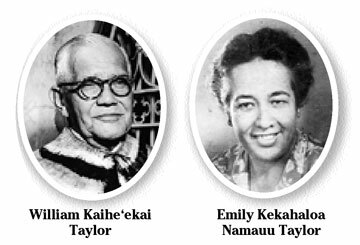 During his life and illness, his grandmother and his mother, Lydia Namahanaikalelekalani Taylor Mai'oho, were strong influences. In 1961, Mai'oho's grandmother was succeeded by a non Mai'oho family member, Iolani Luahine, a kumu hula Mai'oho described as "very powerful and charismatic." Known as Auntie Iolani, she served until 1966 and then the state job as kahu was advertised. Mai'oho's mother, known at Auntie Namahana, applied for the job and was accepted. She took her post on Jan. 3, 1966, and served until retiring in 1994. Gov. John Waihee then appointed Mai'oho to take over and he stepped into the job on Jan. 3, 1995. Mai'oho likes that he and his mother both stepped into their jobs on Jan. 3. "In our family history, there are just too many connections and links. I believe they are spiritual connections and not just coincidences."